There are certain people who thrive at Bed Bath & Beyond. Between the monstrous floor-to-ceiling shelving displays and puzzling vagueness of “the beyond,” it seems as though only those with a trained eye for deals and the free time to get lost in exploration will walk out of the store feeling good about their shopping experience. Offering everything from multivitamins to robotic vacuums, amateur shoppers will inevitably find themselves lost in a never-ending sea of bathroom fixtures and so much more. By now, we’ve armed you with the secrets to conquering similar behemoth retailers, like Ikea, HomeGoods, and Trader Joe’s. Because we believe every design-lover and homebody should have the knowledge and tools to find what they’re looking for, we wanted to get a deeper peek inside, to see what it’s really like to successfully navigate the store. And who better to seek intel from than the people who know every aisle like the back of their hand? We asked experts and employees for the scoop on how to get the most out of your Bed Bath & Beyond experience—without succumbing to a full-blown panic attack. From the right way to take advantage of your 20% off coupons to what really exists in the “beyond,” company spokesperson, Jessica Joyce, and a slew of Reddit users weigh in on helpful shopping hacks to get you through your shopping spree. Ahead, see the tips and tricks you’ll want to bookmark before your next BB&B binge, plus a few product recommendations the pros swear by. Not unlike Best Buy, Bed Bath & Beyond guarantees a “Price Match Promise.” In other words, if you find the same exact bedding for less at Target, they’ll effectively offer the same product at a lower cost. “With continuously changing prices and constant sales, we understand that there may be times when you find an item for less elsewhere and we’re prepared to accommodate,” shares Joyce. One way to save money at Bed Bath & Beyond that you might not know about? If you shop there enough (and, by enough, we mean more than twice a year), becoming a “BEYOND+” member is a great and effortless way to score deals—especially if you’re sick of hoarding coupons in your purse. Note: Not all products are eligible for BEYOND+ benefits. While some exclusions apply (popular brands like Le Creuset, Dyson, and Kenneth Cole aren’t discountable, in addition to most baby products), for $29 a year, the membership essentially pays for itself. You can find all their offer exclusions on the terms and conditions page. The one surprising Bed Bath & Beyond fact Joyce loves to tell friends and dedicated shoppers? No, personal shoppers aren’t just a thing at luxury department stores. 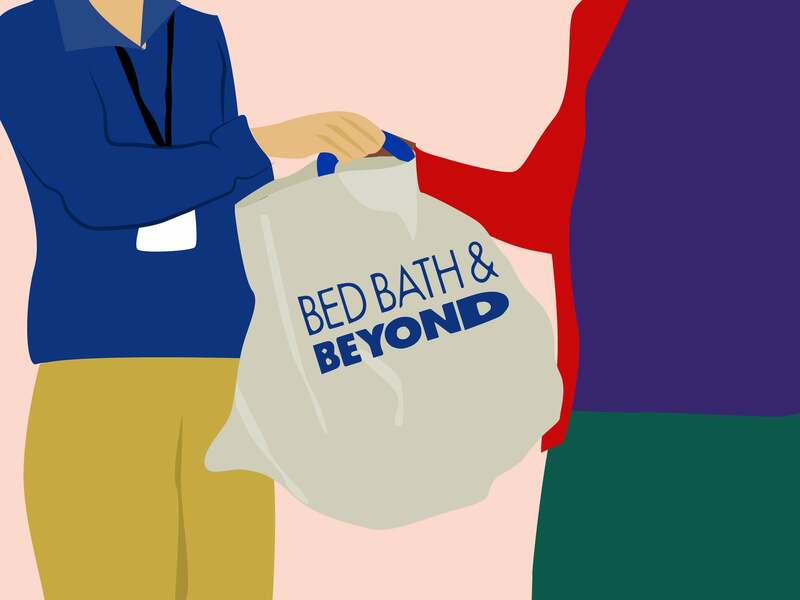 Bed Bath & Beyond’s in-store consultation program is particularly useful if you’re embarking on a major milestone—like going off to college or getting married—and are already feeling overwhelmed. Once you’ve booked your meeting online, a personal associate will guide you through the store to help you build your registry or gather any bulk essentials. “We have so much more beyond the store walls that most wouldn’t think we carried,” suggests Joyce. Although we tend to resort to Bed Bath & Beyond for more common household goods (like toasters, mattress pads, and bath towels), you can actually snag affordable furniture, rugs, and decorative goods in the store as well. “If a sign doesn’t match the ticket price the lower price will be honored and if the ticket price does not match the price at the register the lower price will be honored,” reveals former Bed Bath & Beyond employee and Reddit user, r/frugal. If you’re patiently waiting for a significant price fall, remember that it never hurts to ask! This1neguy adds that most employees are happy to give you a general idea of when the next price slash will be. But don’t wait too long for something to drop, as it will probably be off the shelf by the time you’re prepared to make your purchase. “Once I got to a position with more responsibility, I would occasionally just escalate a percentage off if something looked like it was just gonna sit. Bear in mind that if you wait, you might miss out if someone decides to pick the item up,” he writes. But, only if it’s not an online coupon. “Most stores will take expired coupons if they are the ones sent in the mail (the big, blue 20% off of one item coupon, the 20% off of your entire purchase coupon, the $5 off of $15 coupon or the $10 off of $30 coupon),” reveals r/frugal. BB&B fact: No matter when you bought it, you can almost always return it. For most products, they’ll take it back after on year of purchase. For the company’s exclusive brand items, however, you’ll typically have up to 5 years to return it. Pretty great, right? While you do need a receipt or the card you used to make the transaction to make a return, you don’t need anything in order to make an exchange or get store credit. “A woman brought back an iron because as she was ironing her shirt she ironed the plastic letters on the front of her shirt, melting the plastic on to her iron and ‘damaging” it.’ She got a new iron,” writes r/frugal. For more details, you can check out the company’s return policies here. From a simple mini skillet to an enameled Dutch oven, the retailer’s cast iron cookware staples are a great solution for the budget-conscious cook. What would Bed Bath & Beyond be without silky smooth bedding? “It’s made with verified pure Pima cotton grown in the San Joaquin Valley,” says Joyce of their Wamsutta collection. “The effortlessly elegant and chic Olivia & Oliver collection includes modern, organic shaped fine bone china creating a beautiful tablescape,” says Joyce. “Our kitchen gadget section alone has so many fantastic items that you never knew you needed (like the cherry pitter). You’re going to wonder how you ever lived without it!” laughs Joyce. Want more savvy shopping advice?